That the Cold War was a tense and perilous time in history cannot be denied, and is perhaps a bit of an understatement. The world stood on the edge of Armageddon for most of it, occasionally stepping slightly over the line, and thankfully stepping back before any damage was done. As nerve-wracking as the Cold War was, it had one redeeming quality: it turned us into a spacefaring species. Propelled by national pride and the need to appear to be the biggest kid on the block, the United States and the Soviet Union consistently ratcheted up their programs, trying to be the first to make the next major milestone. The Soviets made most of the firsts, making Sputnik and Gagarin household names all over the world. But in 1962, they laid down a marker for a first of epic proportions, and one that would sadly stand alone for the next 19 years: they put the first woman, Valentina Tereshkova, into space. The decision to send a woman into space came right from the top: Soviet Premier Nikita Kruschev. Hot on the heels of Yuri Gagarin’s successful orbital flight and eager to stick another thumb in the Americans’ eye, Kruschev started the wheels in motion for the first crop of female cosmonauts. Gagarin himself, only a few months after his triumphant return to Earth, was put in charge of the recruitment effort in mid-1961. There was a problem, though. The search for astronauts and cosmonauts is a merciless process where candidates wash out for the smallest of weaknesses, and so a large pool of candidates is needed to arrive at even a small corps of trainees. Both the Soviet and American space programs drew heavily from the military, particularly from the test pilot community, to staff their space program, but there were vanishingly few qualified female pilots in the Soviet Union. To expand the pool of female candidates, the Soviets turned to a somewhat unlikely source: skydivers. What exactly recruiting parachutists said about the confidence the Soviets had in their spacecraft is hard to say, but since courage and a sense of daring would seem to be necessary preconditions for spaceflight, they could have done worse than to draw from a group that regularly jumps out of perfectly good airplanes. Thinking about it further, skydivers are used to rapid acceleration, maneuvering in three dimensions, and dealing with emergency procedures. The recruiting plan worked out: of the five women chosen for cosmonaut training in 1962, four were skydivers. How Valentina Valdimironova Tereshkova came to be one of those skydivers is a bit of a mystery given her early life. She was born in 1937; her father drove a tractor but died in the Winter War in Finland in 1939. She was raised by her mother, a textile plant worker, and didn’t go to school until she was eight. When she was seventeen she started working, first in a tire factory, then at textile plant like her mother. Perhaps as an escape from the grind of factory life, she joined the local skydiving club and went through their training program. She made her first jump in 1959 at the age of 22, and would eventually make 163 jumps. When the word went out that female parachutists were needed for cosmonaut training, Valentina applied. From 400 applicants, she and four others were selected, and for the next seven months this tiny group of women trained together. They piloted MiG-15s, made multiple parachute jumps in spacesuits, and did the usual rounds of zero-gravity plane rides, centrifuge spins, and the other kinds of carnival ride challenges that are part of learning to work in space. She and three of the other candidates passed training in 1962, becoming the first female cosmonauts. Valentina didn’t have long to wait for her chance to go to space. The original idea was to send two of the women into space at the same time in different spacecraft, but as was often the case with the early Soviet program, the mission was changed at the last minute. Valentina would pilot Vostok 6, launching a day after cosmonaut Valery Bykovsky rode Vostok 5 to orbit. After watching Bykovsky rocket away on June 15, 1963, Valentina climbed into Vostok 6, checked in with the callsign Chaika, Russian for “Seagull,” and joined Bykovsky in orbit. She reported significant nausea during her mission, but she spent almost two full days in space without any other major problems aside from a programming glitch that caused her orbit to increase rather than decrease. Valentina noticed the error and reported it to controllers, who radioed instructions to fix the issue. During her 48 orbits, she took pictures, made notes, and maneuvered her capsule to within five kilometers of Vostok 5 for capsule-to-capsule communications experiments. Both capsules landed safely within three hours of each other, although Tereshkova received a nasty bump on the head during the rough Soviet-style land touchdown. Tereshkova, the first woman in space as well as the first civilian, could now write her own ticket. She asked the Soviet government to find the spot on which her father had died; they did, and erected a monument on the spot. 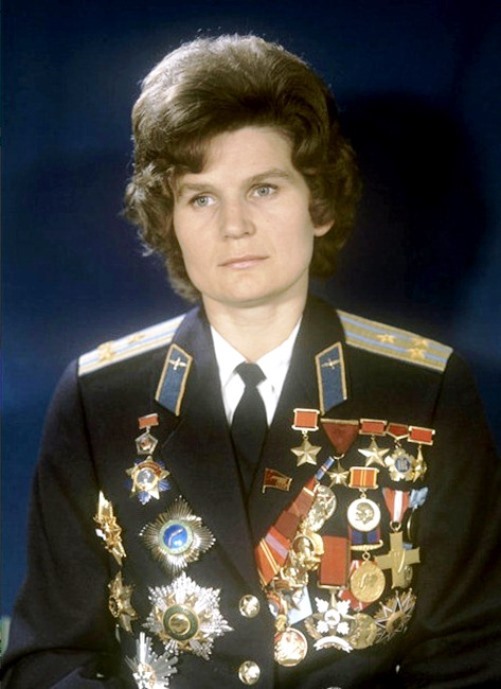 She enrolled in the Zhukovsky Air Force Academy, advanced to the rank of major general in the Soviet Air Force, and earned a doctorate in engineering. She also became active in Soviet politics, serving in the Supreme Soviet. The list of her honors and awards includes the Order of Lenin and Hero of the Soviet Union, plus a crater on the far side of the moon named after her and an asteroid, 1671 Chaika, after her callsign. 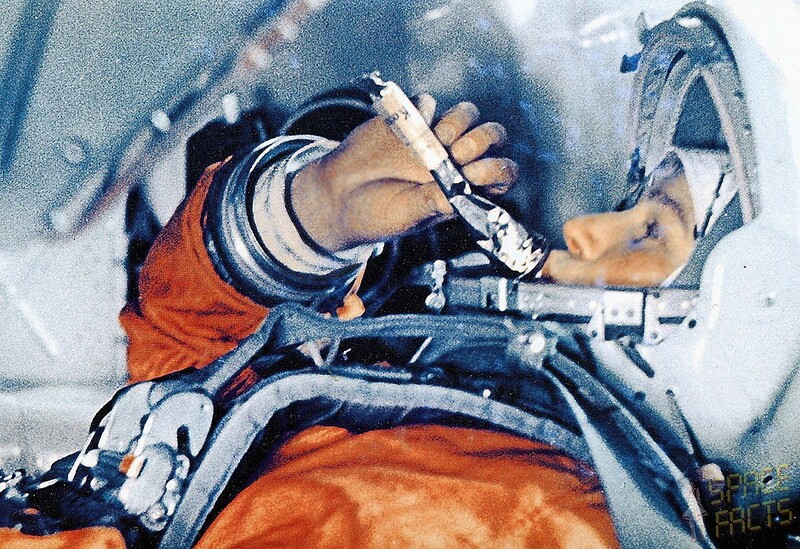 None of the other female cosmonauts ever flew in space, and it would be 19 years before another female cosmonaut, Svetlana Savitskaya, would return to orbit. It would be another year before the Americans would send their first woman astronaut, Sally Ride, up on the Space Shuttle. There have been a total of sixty women in space so far, and there are sure to be many more to come. They all will follow the path blazed by Valentina Tereshkova, but it’s not likely that any of them will repeat the feat of a solo mission in space like she did. Wow! Her uniforms has almost as many decorations and ribbons as a North Korean general! She’s my kind of girl! Disposable? If it was her choice I wouldn’t call her an expendable. It’d be more like a heroic sacrifice for the advancement in scientific research. As fascinating as space tech is (ain’t we in space age now too? ), I *also* long for HAD-articles about the opposite direction. Like in the sixties, where there was all that stuff about living underwater and tiny submarines, in both fact and fiction. The technology has improved greatly, but it’s just not covered. I suppose one of it is the magazines have changed, so no personal sub plans in Popular Science, and Jacques Cousteau is long gone so no specials on network tv about his latest underwater habitat. But I suspect, like the space program, it became routine. I imagine like a lot of things is it’s economics be it space or underwater. Seaquest DSV pretty much killed off all interest. Perhaps Robert Ballard is up to par. He’s a great story teller as well. Yes but Graham Hawkes was an engineer. In my eyes FAR better than Bob Ballard. Are we in a space age? We’re in a low Earth orbit age, that’s for sure. And we have HaD articles about every subject under the sun, what are you talking about? I haven’t noticed an undue bias towards space stuff. Yup, i would too start talking about a space age when we have the first real colony on Mars. “How about submarines?” Awesome idea! Cousteau is a very interesting character — half scientist, half showman, half daredevil. I’d love to bio him. Ballard is also quite a figure. I’ll check out Graham Hawkes. Anyone else we should dig into? Saw a documentary (Nova?) on the people who do underwater oil rig repair. They stay down for months at a time, b/c the decompression just isn’t worth repeating weekly. Living in a tiny pressurized cylinder under continuously deadly circumstances? Holy cow. Jacques-Yves Cousteau was also an inventor – he and Émile Gagnan invented Aqua-Lung. Not many options when all one has is a piece of fabric on their back, and it doesn’t work. I’ve got another by my side. you left out that theres a kerbal named after her. I was going to mention the same thing! She’s my favorite pilot. Was she in space? Yes. Were any other women in space before? No. Seems pretty clear-cut to me: first woman in space. Precisely.. it’s not “First woman in space that ran all the computers and did a bunch of other ancillary stuff” it’s “first woman in space” – full stop. Laika is the first animal in space and most certainly didn’t do any of that other crap. Valentina is the first woman in space. period. end of story. Yikes. And that username, too. You’re a real piece of work, you know that? No, of course you don’t. Yeah, I’ve always thought that hero worship of astronauts is a bit strange. They are just glorified passengers on very dangerous vehicles — glorified truck drivers at best. This is one of the most out-of-touch things I’ve ever read. In the french article on wikipedia it is said that she skydive from 7000 meter out of the capsule. The english version doesn’t give detail of the landing. Did she landed in the capsule or parachute from it? I don’t know. But while the US used water landings, the USSR always landed on land, so maybe it was safer to parachute out than risk the shock of landing on earth. Though I assume that’s changed in more recent times. Recent photos/videos show airbags opening below the capsule before touching down. All of the Vostok capsules were parachuted out of before landing. A fact kept quiet since FAI rules assumed airplane like operations. Voskhod were two men capsules and couldn’t be parachuted out of and the retro-rocket landing system was developed. All flights with the Vostok capsule ended, on purpose, with the cosmonaut being ejected and doing a parachute landing. This was because the capsule’s parachute wasn’t big enough to ensure a secure landing with people inside. It wasn’t until the Vosjod (a modified Vostok with space for a crew of two or three people) that the cosmonauts landed inside the capsule. They used a solid-fuel retrorocket that hung from the capsule’s parachute lines to reduce the speed when the capsule was near the ground (about one-two meters). The current Soyuz capsules have similar retrorockets, but this time integrated in the capsule itself. The heat shield is discarded at an altitude of several kilometres, allowing them to be fired about two meters from the ground, thanks to an integrated altimeter. All this is needed because russian/soviet capsules actually landed on ground, while USA capsules do that on the sea, which acts like a cushion and helps to reduce the impact. Ummm.. holy cow. As if re-entry weren’t stressful enough, you get shot out just before the end too! Still, that’s a great minimalistic solution to the problem of the not-so-soft landing. I wonder if they found this lady in a sky diving club too. From reading sixties articles about amateur radio in the USSR , they seemed to have hobbies well organized. A combination of watching over things but also encouraging things useful to the state. I don’t know if they had scouting over there, but probably they did have some quasi-military activities, after all, there are various cadet programs in communist countries. So parachuting seems to fit into that, which might mean it was well promoted among the young, so it was more blatant than in North America. On the other had, forty years go in high school, I remember some of the kids talking about going parachute jumping, so it does have some appeal. Even about fifteen years ago the daughter of a friend was talking about it, though she was thinking of one of those easy jumps where they are attached to someone who knows what they are doing. I recall reading in the 80s that a very qualified soviet scientist who was female for the record win somehow became disqualified before the flight so Valentina was thrown into the game. Obviously a very cynical record attempt as it was decades before another woman went up. FWIW Sally Ryde, the US’s first woman in space was later out of the closet making her possibly the first LGBTQ in space, at least there are no earlier ones to be publicly out. The second soviet woman in space was a badass who also went out on EVAs working on Salyut 7 mini space station. You’re welcome! As much as I thought I knew about the early space program, I always scrape up something interesting that I never knew. For example, Valentina married another cosmonaut a few years after her flight. They had a daughter, Elena, who I think remains the only child of two people who have been in space. IIRW, in earlier Vostok spacecraft the the cosmonaut would eject from the craft before landing using a “personal” parachute, so a skydiver is a must. Well I found it interesting. Even though this is something I am already familiar with this story. And given the shape of the country the, a land landing is a requirement for their program. They still do that today. Yea, made cadet LtC, got my pilots license, and actually flew some SAR redcaps with a cadet ELT beacon scanner aboard. I had a F-15 waiting for me to graduate college thanks to future-wife’s uncle, a retired real USAF LtC with a friend who stayed in and got stars but I wrecked my spine working as a working as(after earning) fire/paramedic my last year of school for scholarship money from the city. But interesting that during WW-II CAP was the only way for a civilian to fly, somehow CAP acquired bombs and torpedoes and there were several confirmed kill Nazi subs off the US east coast, their USAF re-charter forbade arms after the war. Have you seen the state of the average jump crate?? I’m not entirely sure they qualify as perfectly good airplanes. Still flying without immediate problems, sure. Anyway, you know the most dangerous part of a flight right? It’s the landing. So why stick around for that!